I have a new nephew on his way! Or maybe it’s a niece. But following in the steps of his three older brothers, we all think he will be a he. 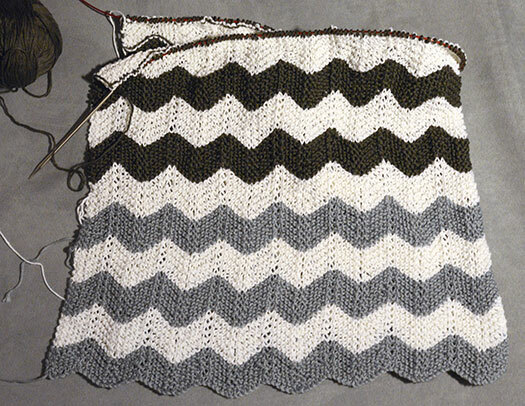 And when I asked my sister-in-law what she wanted me to knit for this soon-to-arrive baby, she said a baby blanket. I cringed. I’d avoided blankets—I loved sweaters, liked hats, and occasionally did the odd scarf. Blankets, on the other hand, seemed like such projects of patience with very little interest (at least in terms of shaping). But, I soon discovered that therein lies the beauty of knitting a blanket—a large expanse of texture and color revealing itself over time. This epiphany occurred after much perseverance. It became quite obvious that I’d been away from knitting too long when I had to begin the project three times over because of miscounting / misreading the directions / using the wrong needle size for the thread. That last one really hurt my knitting ego. I somehow misread the 6mm (which is a size US 10 needle) for US 6 needles and got a sloppy mess for several rows before I stopped myself to really look at what was going on. My initial misgivings I blithely ignored (my brain said the knitting would tighten up as I got used to the new pattern). Then those misgivings sank in their teeth, not to be dismissed when my knitting was more netting than a cozy blanket for a baby. 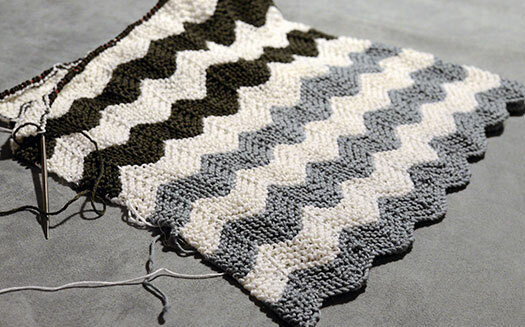 Thankfully, the Chevron Baby Blanket pattern I discovered on Purl Bee was inspiring enough to frog the project three times before getting it right on the fourth attempt. More details to come. But, for now, I’m enjoying the rhythm of this pattern and watching as the fabric develops into beautiful diagonals intersecting with vertical columns created by the increases and decreases. This entry was posted in Craftmanship, Knitting. Bookmark the permalink.